American essayist and Harper's contributing editor Garret Keizer offers a brilliant, literate look at our strip-searched, over-shared, viral-videoed existence. Body scans at the airport, candid pics on Facebook, a Twitter account for your stray thoughts, and a surveillance camera on every street corner -- today we have an audience for all of the extraordinary and banal events of our lives. The threshold between privacy and exposure becomes more permeable by the minute. But what happens to our private selves when we cannot escape scrutiny, and to our public personas when they pass from our control? In this wide-ranging, penetrating addition to the Big Ideas//Small Books series, and in his own unmistakable voice, Garret Keizer considers the moral dimensions of privacy in relation to issues of social justice, economic inequality, and the increasing commoditization of the global marketplace. Though acutely aware of the digital threat to privacy rights, Keizer refuses to see privacy in purely technological terms or as an essentially legalistic value. Instead, he locates privacy in the human capacity for resistance and in the sustainable society "with liberty and justice for all." 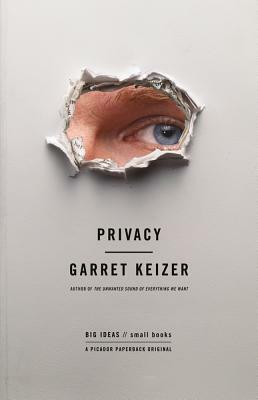 Garret Keizer is the author, most recently, of Privacy and The Unwanted Sound of Everything We Want. A contributing editor at Harper’s magazine and a former Guggenheim Fellow, he has written for Lapham’s Quarterly, The Los Angeles Times, Mother Jones, The New Yorker, The New York Times, and The Washington Post, among other publications. He lives in Vermont.